There are so many facets of John Fahey’s career that it is hard to pick a favorite. I love Red Cross the best of his late period due to its exquisite mix of ambient smears and Gershwin and Irving Berlin Covers as well as the brass band excursions on Of Rivers and Religions. Of course, his early albums occupy a dear place in my heart due to their role in opening my eyes to the land of Folkways, Vanguard and a cadre of shaggy dog folkies and burnouts. 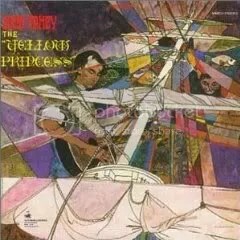 However, The Yellow Princess is the one listened to most because it is positively overflowing with melancholy and members of Spirit are on hand to spin the bottle in some unforseen directions. This rare collaboration pays dividends on “Dance of the Inhabitants of the Invisible City of Bladensburg” which begins with the crash of drums before transitioning into familiar finger picking until the coda breaks into a bluesy swagger. Spirit drummer Kevin Kelly also twists Fahey into new shapes on “March! For Martin Luther King” where a mournful, funereal beat keeps the time while a beautifully evocative series of strums pay tribute to a fallen hero. You can almost envision a casket being carried while the duo exorcised their sadness in song. Fahey always had a predilection for odd musique concrete by way of the acoustic guitar. Some of my favorite tracks of America, Womblife and City of Refuge were his most unhinged, but “The Singing Bridge of Memphis, Tennessee” takes the cake. It sticks out like a sore thumb amidst the folksy meanderings, but a whistling refrain humorously mimics the cry of a train as spare percusssion mimics the chug of a broken down train. An ominous buzz hovers over the short instrumental and provides an eerie atmosphere to accompany the wholesome whistle that echoes throughout it. It ain’t much, but it has stuck with me long after it is removed from the stereo. I guess The Yellow Princess stands out among the rest because it tackled new horizons for only a moment, but left me wanting so much more that was never fulfilled. Yes, he made countless other albums, but none quite like this.